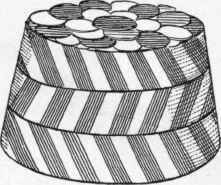 Fill the outside of a double mold with clear aspic jelly (see page 321), and the center with a macedoine of vegetables, or with celery, or with any one vegetable. Marinate the vegetables; then mix them with Mayonnaise made with jelly instead of eggs (see page 290). Cover the top with jelly so the vegetables will be completely enclosed (see directions for double molding, page 325). Turn the form of salad on a flat dish, and garnish with shredded lettuce. RUSSIAN MACEDOINE SALADS WITH ASPIC. PINK AND WHITE OUTSIDE, CENTER FILLED WITH CELERY, PEAS AND BEANS, MIXED WITH CHICKEN ASPIC. 3. Truffle. 5. Slices of hard-boiled egg. 7. Turnip. 9. Turnip. Ornament the bottom of small timbale-molds with carrot cut into fancy shape in the center, and a row of green peas around the edge. Add enough clear aspic or chicken jelly to fix them, then fill the mold with jelly; when it has hardened, scoop out carefully with a hot spoon some of the jelly from the center, and fill the space at once with a mace-doine of vegetables mixed with jelly Mayonnaise as above. Serve each form on a leaf of lettuce. Pass Mayonnaise separately. 1. Pate de foie gras and aspic jelly in layers. Daisy decoration made of hardboiled egg. 2. Russian Salad decorated with green peas or capers. 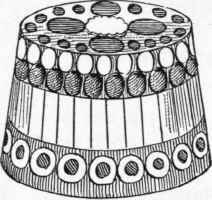 Molds of salad in aspic may be elaborately decorated with rows of different-colored vegetables, or they may be arranged in layers like the aspic of pate. ; Individual salads, when served for suppers, buffet lunches, etc., may be placed around graduated socles in a pyramid. Decorations of capers and parsley, also of truffles and tongue, are suitable for Russian salads.